Somethin' Else label reissue series of great jazz albums from late 1980s to early 1990s! Brand-new, 24-bit remastering and pressed on SHM-CD! Special limited edition! Somethin' Else label was established in 1988 by Toshiba EMI's producer Hitoshi Namekata to present new recordings of the current jazz artists, both American and Japanese. With Toshiba EMI's alliance with Blue Note in the U.S., he had access to the fantastic roster of Blue Note, both young and seasoned. Looking back now in 2013, the early catalog of Somethin' Else has historic significance, introducing many young talents who are now giants, releasing fresh and important albums by veteran artists, and realizing unusual and unexpected collaborations. Now, the best albums are available again, this time on superior-sounding SHM-CD with brand-new, 24-bit mastering! 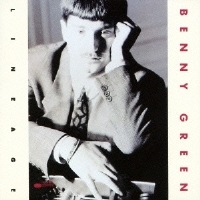 "Benny Green was in Art Blakey's Jazz Messengers when we at Blue Note first heard him. We all fell in love with the spirit and wit in his playing and his depth of knowledge in the hard bop idiom that defined Blue Note. We signed him in late 1989 and Lineage was his first album, recorded at the end of January 1990 with the first-class team of bassist Ray Drummond and drummer Victor Lewis. We were amazed that a 27-year-old pianist would have such command of obscure pieces like Elmo Hope's "Crazy" or Bud Powell's "Glass Enclosure." He proved a dazzling and consistent artist who fit the Blue Note mold perfectly." Recorded at A&R Recording Studio, New York City, on January 30 - February 1, 1990. SHM-CD uses an advanced polycarbonate material for superior sound quality and is compatible with all CD players.